Syma x11 - Review of The Best Beginner Drone for 2017? Home » Reviews » Beginner/Training Drones » Syma x11 – Review of The Best Beginner Drone for 2017? Syma x11 – Review of The Best Beginner Drone for 2017? 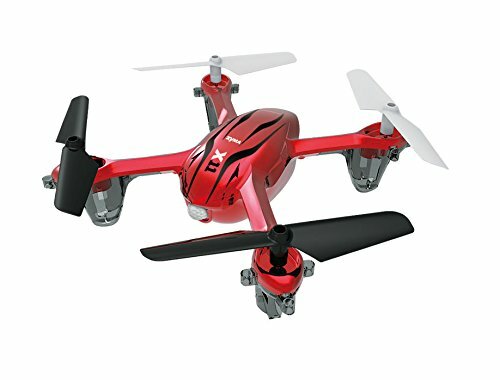 Best Beginner Drone for the Money! The Syma X11 ‘Hornet’ is excellent for beginner & intermediate pilots! Super stable and connected! The Syma x11 or Syma Hornet Drone is excellent for beginners and has been touted as the best drone for beginners and intermediate pilots. We are here to give you our x11 review and rating! Syma has been creating great drones at inexpensive prices. They didn’t fall back when it comes to the x11 either. 35.4 grams flying weight with prop guards. The x11 Syma is small in size, you can hold it at the tip of your fingers without any difficulties. It weighs in at only 36 grams! It comes equipped with prop guards, which are great for any drone lover, especially beginners! Prop guards will give you more safety, that way you won’t risk cutting yourself on a pair of propellers. Another great thing about the prop guards is that the chance of you having to replace the propellers decreases because the guards add extra durability and life to your propellers. As with other small quads you need to be careful with your x11 while outdoors! Because of it’s small size you will not be able to fly it on a windy day. Whereas moderate winds will do it hardly any if none damage at all. If you are a beginner, we recommend you first test drive your bird in an indoor area, that way you get a feel for your bird and it will be much easier to fly once you go outdoors. The x11’s range is fairly decent as well it is designed to be flown within 100 feet (30 meters). allowing you to fly your bird without any complications. The transmitter is in the shape of a joystick. The controller is a basic thumb controller, which means that any dummy can use it. It also allows you to fly the quad in two different speed modes. The controller resembles an XBOX controller. It is equipped with a 6 axis, which allows you to have a smooth and precise flying experience. Another great thing about this quad is that it is equipped with LED lights from the bottom. This is great if you are flying your bird at night or even for orientation during the day. But how good are the batteries on this drone? This baby powers on 4 double A batteries, it comes with a charger and USB cable as well. It will take you approximately 35 minutes to charge your drone. The charger also lets you know when the charging is complete, because you have a red light that is on while charging your bird so obviously once charging is complete the red light turns off. The Syma x11 hornet offers you with 7 minutes flight time. A great tip for those that decided on buying the x11 hornet is that if you purchase the Hubsan 500 amp battery you can manage to get 13 minutes of flight! No other quad this size will fly as long as this bad bee! Check out the Videos on the X11 – Reviews and Guides on Flying the Hornet! An advantage that the Syma x11 has over it’s competition is that Syma has equipped it with geared motors. Geared motors are very uncommon in quads. This is a great thing because it allows the x11 hornet to fly more stably and gives the whole bird more stability. This quad also allows you to do 360 spins, this option will be a blast because the quad is small and you can perform various tricks with it. , obviously making it a quadcopter. It comes in a fiery red color and the propellers are usually white, flying this baby in the air looks quiet amazing! The body’s shape of the x11 Hornet resembles that of the Hubsan x4 but it has it’s advantages above the Hubsan. The durability on this quad is quiet expensive, it can take a good beating. The great thing about this quad is that it isn’t priced very high, you can get this baby starting at $30 and taking its way to up to $50. It’s definitely worth it’s price though, just make sure you take good care of it because it is sensitive and needs to be looked after! Syma X11 is often compared with Hubsan X4, as these 2 models are in the same price range. Both of these drones are great for messing around your backyard. But Syma X11 has one major advantage over X4: it is much more stable than Hubsan that has some serious problem with drifting. It is also better for flying indoors, flies smooth and is quiet in comparison to X4. Hubsan on the other side is much faster, has better camera and has longer range. The Syma X11 Hornet is by far one of the best entry-level quadcopter drones in the market. If you’re a more advanced dronist who is not just starting out, there might not be much in the X11 for you. If you are a noob dipping his toe in the drone waters, we highly recommend you purchase this little beast because it’s really worth it’s price and you will have a blast with it!